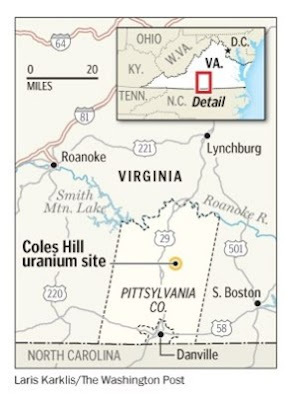 In the coming session, the Virginia General Assembly is expected to consider lifting a 30-year moratorium on uranium mining permits that some say would clear the way for the first uranium mine on the East Coast. The lode, with an estimated value of $7 billion, is said to be the largest undeveloped deposit in the country and among the largest in the world. It is buried near Chatham, Virginia. On January 16, 2007 Virginia Uranium was formed, with Walter Coles as chairman and his son, Walter Coles, Jr., as Executive Vice President. Norman Reynolds, who had been president of the predecessor company, Marline, brought his valuable experience to the table as a Director and as President and Chief Executive Officer. Investor confidence in the company has not lagged, with a total of $39 million being invested in the project since 2007. Much of that has been spent in additional studies of the ore body, as well as in informing Virginians and their legislators of the enormous positive impact the enterprise can have on the state and region as well as on the nation’s energy security.